Which is the best Ultra HD (UHD/4K) TV in India? When it comes to being absolutely the best, 4K Ultra HD televisions are miles ahead of their 1080p full HD counterparts, given you have the content of course. 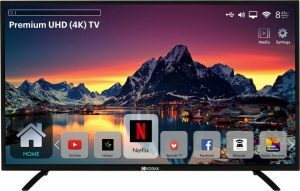 But with the resolution getting popular and the likes of Netflix being available in India, it makes sense to buy one if you’re looking for a new TV. To help you, we’ve compiled a list of the best 4K LED televisions in India under Rs 50,000. Many of these support HDR and we recommend getting one with HDR to be future proof. Check the list of best 40 inch LED TV in India, as well as the best 50 inch LED TV in India. First-time buyers can also refer to our smart TV buying guide. We’ve only covered models up to Rs 50,000 to not create a long and confusing list. 4K TVs are usually smart. So here goes the list of top Ultra HD LED televisions in India under Rs 50,000 for this month. You can find our list of the best 55-inch TVs under Rs 50,000 which only has 4K UHD TVs listed comprehensively. If you usually use a TV for only normal TV viewing, 1080p TVs are more than adequate. Given the lack of 4K content, spending the extra money for a resolution that you won’t even use doesn’t make much sense. However, if you game on your consoles (PS4 Pro or the Xbox One X only) or have a high-end PC that you connect to your TV, we suggest getting a 4K TV. The extra resolution is worth it. Also, those looking for a 5-year investment should also consider a 4K TV given that they are more future proof. Now, HDR might not matter on a 1080p TV, but it sure does matter when you’re getting a 4K TV. No, it’s not got anything to do with the resolution, just that buying a 4K TV without HDR doesn’t make sense. If you’re future proofing, why not do it properly? Most of the 4K content supports HDR too. Also, look for TVs with HDMI ARC if you plan to plug in a home theater system. Otherwise, you’d be stuck with 2.1 support on an aux cable. Lastly, the refresh rates are more of a market gimmick. The two rates that are usually standard are 50/60Hz and 100/120Hz. Everything above is generally a lie. In fact, CNET has a detailed article that talks the truth about TV refresh rates.